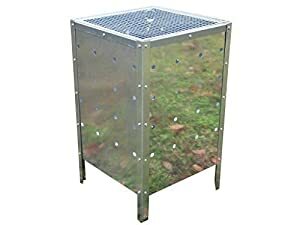 Garden incinerators & Fire Pits are delighted to stock the brilliant Primes Large Square Garden Fire Bin Incinerator Galvanised 90l Burning Rubbish Trash. With so many available recently, it is great to have a make you can recognise. The Primes Large Square Garden Fire Bin Incinerator Galvanised 90l Burning Rubbish Trash is certainly that and will be a superb buy. For this reduced price, the Primes Large Square Garden Fire Bin Incinerator Galvanised 90l Burning Rubbish Trash is widely respected and is a regular choice with many people. PRIME FURNISHING have provided some great touches and this equals great value for money. Ideal for disposing of your cuttings, leaves and general garden waste. Easy to assemble. Overal Size: L40cm x W40cm x H75cm Internal incinerator dimensions: L39cm x W39c, x H60cm Galvanised 0.35mm container wall . Galvanised 0.90mm feet . Net weight: 5kgs Loading capacity: 1.2kgs . All sizes are approximate.